I have used the Huntin' Hoist with strap for archery, firearms, and muzzle loader seasons...works like new years later! This is a fantastic product and works hassle free! 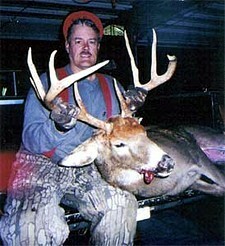 Picture attached of the 8pt wall hanger I harvested today in Western Maryland firearms opening day. Thanks for a great product that works like a charm! Mike took this nice Buck about 3 week's ago. Your Product is Great...we use the Huntin Hoist for everything . This is Rick with 1 of his two pope and young bucks of 06. 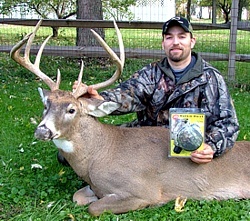 This is a eleven point 245Lb field dressed monster Illinois buck. Rick has a huntin hoist hat on and utilized the hoist to harvest this trophy! 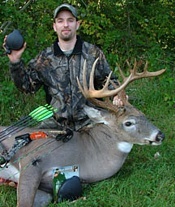 "I encounter enough problems when I am in the field bow hunting. So if I can make things easier and problem free before the hunt, I am ahead of the game. That is why I utilize the HUNTIN' HOIST by DOYLE'S DEER GEAR. The HUNTIN' HOIST provides a safe and easy way to raise and lower your bow and archery tackle from your treestand. I won't hunt without it." Tom Nelson, Host - "The American Archer"
My name is T. J. Shimunek and I am the Host/Executive Producer of Gammy Creek Outdoors. We spoke a few weeks ago and you sent us a few Huntin’ Hoists to use this spring. I absolutely love this product and it is officially a part of my gear bag from now on. As much as I enjoy your product it does not come close to what our videographer thinks of it. Before the Huntin’ Hoist our videographer would climb into the stand with one hand and the other holding $8,000 worth of video equipment. One wrong step or slip up and the hunt is ruined. Your product allows us to get our gear into the tree safely and worry free. 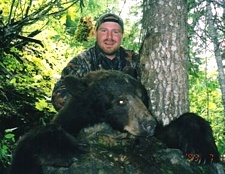 I have enclosed some pictures of a beautiful chocolate black bear I harvested in Idaho that will make Pope and Young by over an inch. My livelihood depends on products that have to work in the field. That’s why Huntin’ Hoist will be joining us on each hunt from now on. Hi Roy, Yes, I have used the Huntin' Hoist quite a bit already. I've been practicing shooting out of my treestand and it's really handy! It's out of your way when you don't need it and right there when you do. The clasp for wrapping it around the bow is about the most ingenious thing, so simple almost foolproof. When I've shot all my arrows, I lower the string down to my shooting partner and zip them right back up. I'm never going back to the woods without it! Let me know if you need anything more, or give me a call. 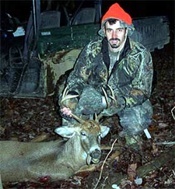 "The huntin hoist helped me harvest my first deer. It has a 13.5" inside spread, 20" neck measurement under the chin, and was aprox. 140lbs. Not a giant, but a nice deer for my first. I shot him @ 65yds. on Thanksgiving day in a woods I had never been in before." "I saw a new product report on your hunting hoist, well its something I have been looking for a long time, This past season has been aggravating as open rope gets twisted, tangled and is so frustrating when you try to get set up in the stand, As a representative for the New York Bowhunters I will be sure to spread the word. I just ordered one today and wish I had it in October..... Feel free to send along any promo items you may have as I will surely help pass the word on this great new item. My hunting partners will be sure to be jealous!" "rec'd the new hoist on Saturday, I should have had that at the beginning of the season. I can see that I will be needing another for the other side of my stand. Hopefully I can put it to the test next weekend. 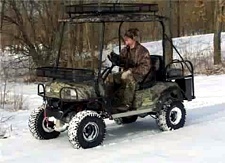 Thanks again for an awesome product.."
"Dr. Dave Samuel introduced the Huntin Hoist to me. It works very slick. I clip it on my waist quiver and I never have a problem with rope tangling on steps, stand, or various limbs. I also like that the rope stays with you. You won't leave any scent from your hands on the rope available to the deer nose." "I started my son bowhunting this season and the huntin' hoist took care of one more thing I needed to educate him on! He is up the tree and I dont have to stand around and make sure he doesnt get tangled up. Its a awesome porduct for the low cost!" 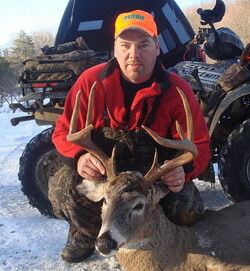 Hi Guys, Thanks for making a great product here is a picture of my brother Mike Baker's deer. 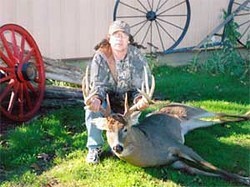 He took this deer Oct. 2nd and it gross scores 158 2/8. Not a bad Ohio buck. Thanks again for your support and good luck hunting. Doyle, This fall I purchased a huntin hoist and it works great. This is one of the best additions to my hunting gear ever . I hunt approximately 70 times a year and this product has worked flawlessly. This year I harvested two 10 pointers, (a 154", and a 138") along with three other deer so far, and the huntin hoist has been a factor in every one of these harvests. Thanks for such a great product. I was introduced to the Huntin' Hoist last summer at a deer show. After using the Huntin' Hoist, I found that it is THE best retrieval system I have ever used. Very simple to use and no more tangled ropes. I will always have one in my pack. To Whom It May Concern: I just wanted to send a quick message and tell you how much I have enjoyed my Huntin Hoist. This is one the best hunting accessories that I have purchased. I have been telling all of my hunting buddies. No tangles or knots. I climb in my stand and pull my bow up and the string retracts into the case. It may be a small part of my hunt, but it allows me to get in the stand quickly and with the least amount of noise and problems. "...I also purchased a Huntin Hoist from you. It rank's up there in all of the hunting accesiores I have purchased over the year's.I bagged my first whitetail this past archery season with my bow and your hoist.It is extremely easy to use and very compact light weight I love it no hassles at all. I don't think I could hunt without it again." "Hi! I saw your huntin' hoist on the Bighorn Outdoors TV. show. It Reminded me to send you this email , I purchesed one of your huntin' hoist at the Harrisburg Sports show earlier this year. I played with it and tried it out. I can't wait to use it this fall's archery season in PA. No more string birds nest. Thanks for a great product. I will tell all my hunting buddies about it. " "Bought two of your huntin hoists. This is a product I have been looking for a long time. For many years I became frustrated fumbling with tangled pull-up ropes. This year however sealed the deal--I had climbed about 23 feet up in my climber when the crimped end of my cheap pull-up rope left go as I had just brought the bow to my 23 foot level, but couldn't grab it in time. Laying at the bottom of the tree was my bow--standing on a platform 23 feet in the air was a very angry bowhunter. Your product solved this problem. NEVER again will I use a pull-up rope, and take a chance. Beside that I am sick, and tired of wasting time untangling cheap ropes. I have tried several smaller diameter rope materials with the same knotted, tangled messes. NOT ANY MORE--GREAT PRODUCT--LOVE THAT PATENTED HOOK-UP. There are alot of gimmicks out there in todays hunting gear world. THIS ISN'T ONE OF THEM. This was a must have for me. Nice idea--well made product." I am the hunter education coordinator for the Ohio Division of Wildlife and I am responding for Dave Wilson. I ordered 700 of the Huntin' Hoists to use for incentives to give to instructors that schedule a Hunter Education Course in the month of November. We train a large portion of our students in November and this is when we have the highest demand for courses. These incentives can be used as training aids to demonstrate the importance of using a "haul line" when entering or exiting their treestands. In the past couple of years I have bought hats and gun cleaning kits to use for this incentive. This is basically my planned use for your product. By the way it was a real pleasure working with your company and delivery was very prompt. I received a Huntin' Hoist for my birthday a couple of weeks ago. I've already had my treestand out to see how it works. LOVE IT!!! I have a suggestion for next years model. Instead of black, use a green, gray, brown combination of plastics to give it a Camo look (No sense in paying the big camo companies a licensing fee!). The Huntin' Hoist will become a permanent addition to my field gear. I'm thrilled to see an Indiana company introduce such a great hunting accessory. You guys hit a Home Run with this one!